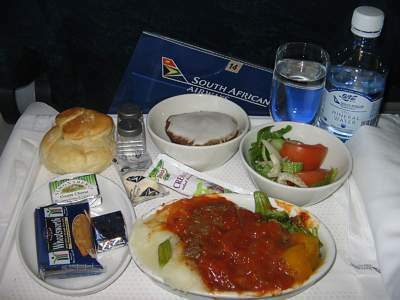 Food on South African airlines is plentyful and good, and is geared towards European tastes. 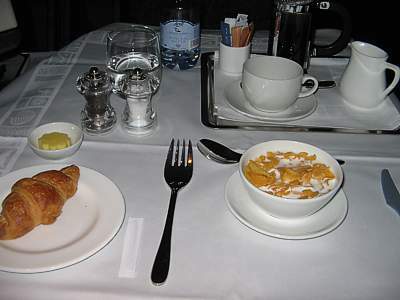 Metal knives & forks are used on all flights. 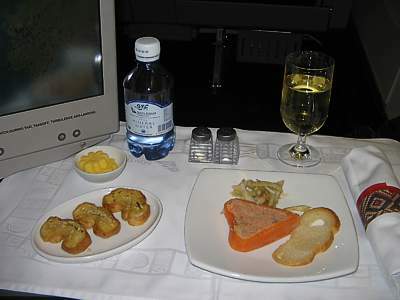 You need to time your flight carefully to make the most of Business Class on a Domestic route. From 1200-1400 and 1700-1900 a much larger meal is offered, with a choice. Outside these times, you'll only get a small snack. Pasta with tomato sauce and lamb mince. Tomato and lettuce salad, with a bag of salad cream. Iced carrot cake. A hot roll. Wheatsworth biscuits. Simonsberg cream cheese. Cheddar. A chocolate. This represents one of SAA largest domestic meals. It's actually pretty good, with lots of flavour. The carrot cake is a bit of a disapointment, and the salad is very bland. A bagette with two slices of salami, and melted cheddar cheese. Cheese, tomato and carrot salad, with a bag of salad cream. 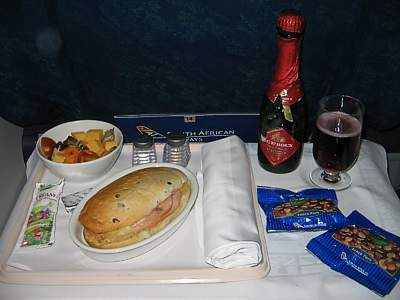 This small snack makes you wonder why you paid extra for a business class seat. 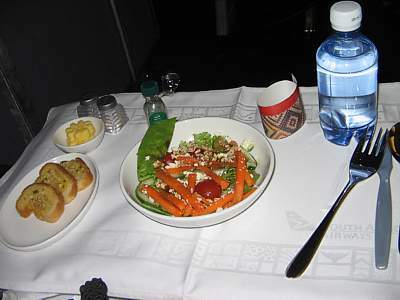 It is exactly the same as offered in economy: the only difference being that it comes on a tray, and has a salad. 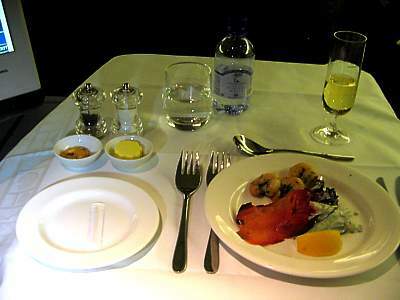 First class is pretty much the last word in luxury - although you may not think that when it comes to the food. 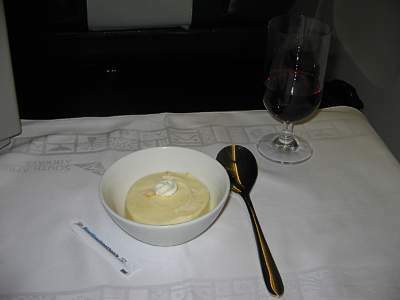 It is marginally better than in business class, but it is hardly gormet. There are plenty of courses, and yet sometimes you can be left going hungry. Not good, considering the thousands of pounds you may have paid for a ticket. You will get a tablecloth at your table, and two very nice salt & pepper pots. Three vegetarian canapes. Three meat canapes. 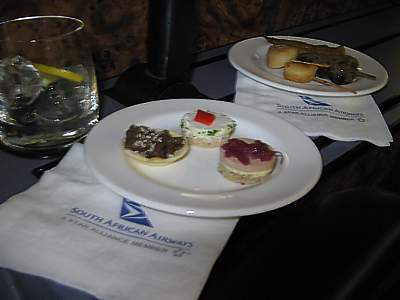 This is how your first class meal on SAA starts. You are offered either veggie or meat canapes, however you can have both. 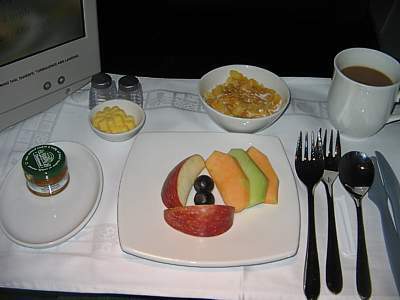 Do take them - if you are on the late evening flight, it can be two hours in (and gone midnight) before you get your real food. Three prawns, a sliver of salmon, lettice, and a slice of lemon. Cucumber and dill salad. By now you will getting very hungry - and this doesn't appease the hunger pangs much either. Very nice prawns and salmon, however there really isn't much to this. 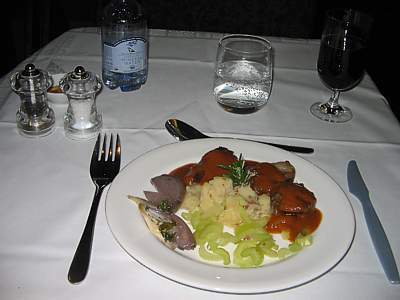 Braised rump of lamb, in red wine jus, accompanied by potato mash, roasted red onion and celery. Now this is more like it. Lots of flavour, done nice and tender, and presented just right. Its such a pity that portions are so small. 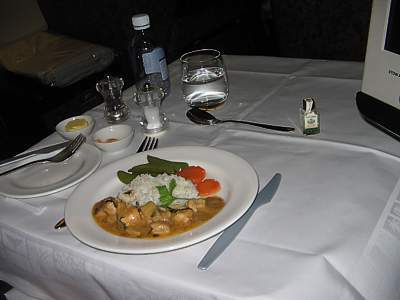 Breast of Chicken served with red curry sauce, steamed Thai fragrant rice, stir-fried carrots and sugar snap peas. This resembles a microwaved meal for one. It even looks as if it's been dumped out of the carton straight onto the plate. No flavour, no content - for first, this is an embarasement. A selection of Port Salut, Boursin, Butler's Secret, Somerset Brie, Shropshire Blue. 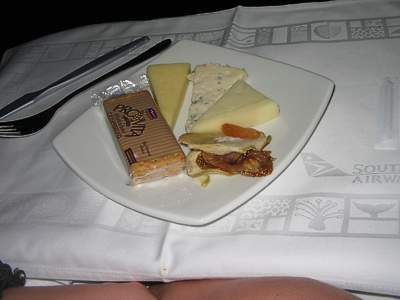 The First cheese plate is an embarrassment when loaded in South Africa, only a bit better from elsewhere. At least when you get offered this, you get a nice glass of Tawny port. Vanilla and Chocolate ice cream. 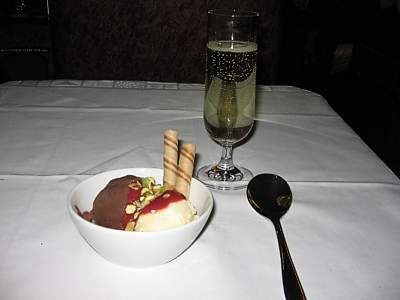 With a chocolate sauce and rasberry coulis, toasted flaked almonds and a wafer. 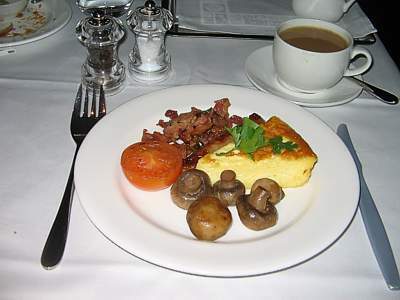 Rough cut bacon with parsley, grilled tomato half, button mushrooms, cheese frittata. Ah, after a hot sleepless night in the first cabin, this cures the hangover nicely. No greese, and done just right. The cheese frittata is however very heavy going. Very little to this - in economy you get the same. Slices of Kiwi, mellon, grapes, grapefuit, a strawberry. 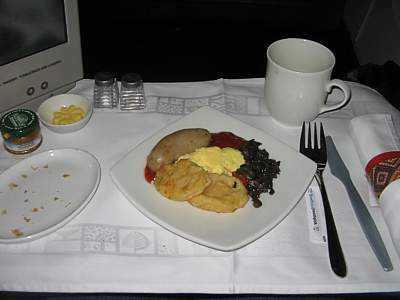 Business class food is rather basic, and compared to other airlines portions can be small with little choice. Having said that, the selection has good flavour, and is presented well. You might, however, want to eat before you get on the plane. You will get a tablecloth at your table, and two simple salt & pepper pots. Some of the items on your menu will be marked as "Le Quarter Francais". These are created by Margot Janse, the chef at this restaurant in Franschhoek (part of the cape wine region). It is votes one of the top 50 restaurants in the world - and has dishes with a distinct South African twist. Although, oddly, with a French name & style. Mixed seasonal salad, with lettuce, cucumber, and carrots, mixed with goats cheese and tomatoes. Balsamic and olive oil dressing. Three slices of garlic bread. A pot of butter. This is a very good salad with lots of quality and quantity. A creamy coriander dressing is offered as an alternative. Potted Salmon Terrine in a pepper, with pickled pearl onions, fennel bulb salad and crostini. Three slices of garlic bread. A pot of butter. This is the Quarter Francais alternative - and as such is very good. Chicken in gravy, stuffed with prunes and thyme, served with butternut and potato gratin, honey, lemon and lavender sauce. 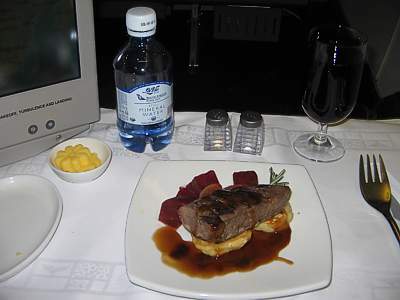 Very standard, this meal wouldn't be out of place in economy. Loin of Springbok with slow roasted baby beetroot, caramelised onion ragout and potato blini. This is the Quarter Francais alternative. 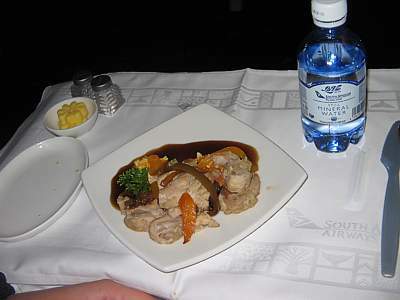 It is fantastic, and one of the best meals I've had on South African. A selection of Danish Blue, Raigmore Ayshire Cape Salut, and Twelve Month matured cheddar. 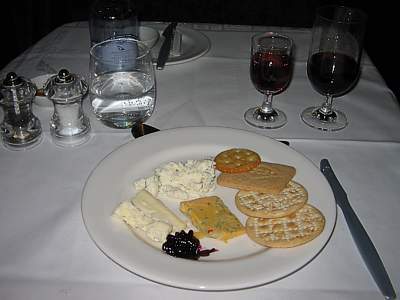 The cheese plate is a poor selection, and an embarrassment for South African. At least when you get offered this, you get a nice glass of De Krans Cape port. Three citrus and white chocolate ice cream rounds. 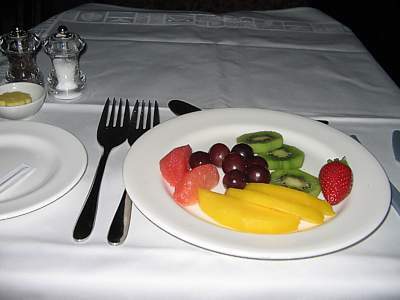 A fruit plate with two slices of apple, and three slices of melon. Two grapes. This is really a bad embarrassment for South African, with very little here. It's a bad awakening on South African. After this lot, you'l be very tempted to ask for the fully cooked option. Scrambled Eggs, with grilled beef sausage, sauteed button mushrooms, corn fritters, and grilled roma tomatoes. This minimalist creation will leave you begging for more. Thankfully you get offered plenty of crossants.